Discuss the proper clothing, footwear, and personal gear required for small-boat sailing in warm weather and in cool weather. Explain how choosing the proper clothing, footwear, and personal gear will .help keep you comfortable and safe while sailing. Get underway from a dock,. mooring, or beach. *The skill demonstrated on any boat available to the Scout; sailboards are not acceptable. While no specific sail plan is recommended, it is suggested that the craft be smaller than 20 feet. The boat must be capsizable and have the capability of sailing to windward. Note: There is an editorial error in the 2017 Boy Scout Requirements book, in requirement 1b. 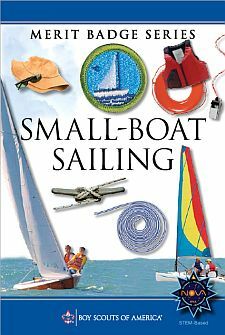 ("... while canoeing:" should read "... while sailing:") The correct wording appears in the Small-Boat Sailing merit badge pamphlet.